Anyone who has been to New York would have seen the many street food carts with signs marking them as 'Halal' serving what is known as Chicken/Gyro over Rice; Basically this platter of food consists of either chicken or lamb (also known as gyro) piled on top of a bed of rice alongside some salad & pita bread, and then drizzled with lots of white sauce and based on how much heat you can take, a dash or more of hot sauce; its all served together in a platter which you then combine and eat. It's quite interesting to find out that this street food which is like so popular there is linked simultaneously with "Halal Food"; It all started off when this street food vendor (probably middle eastern) opened a cart at the corner of 53rd St. and 6th Ave, basically walking distance from Times Square & Central Park and right in the middle of one of Manhattan's busiest streets. For about $4-$5, the Halal Cart Guy would serve Shredded Chicken and/or Lamb Gyro on a bed of Basmati Rice along with Salad & Pita all smothered in this top secret white sauce, drizzled with fiery red hot sauce and crammed together in this aluminum tray. He started off with catering to the Muslim population, the cabbies and the like but the food was so good that it ended up getting major popularity among the rest of the population from residents to tourists; the original street cart has a line which can lead upto like two blocks, but it has also led to the mushrooming of Halal Food Carts across the city. Every vendor has their own style of making this combination of meat, salad & rice, with their own secret recipes for marination & sauces; but the best part about this street food is that its Halal so its convenient for Muslims and then its delicious, affordable and available almost everywhere in the city. Having been craving this for a while, I found a recipe on making this from the website Serious Eats and tried it out yesterday; it had a lot of different components and after mixing it all up it tasted exactly like the ones that I used to have from the vendors; absolutely delicious and again one of this one-dish meals that can be just served up together; the sauce just needed a bit more work, and I would probably add a bit less vinegar and mayo but still absolutely delicious. Adapted from Serious Eats: A Comprehensive Guide to Making and Eating Delicious Food Wherever You Are by Ed Levine and The Serious Eats Team. For the chicken: Combine the lemon juice, oregano, coriander, garlic, and olive oil in a blender. Blend until smooth. Season the marinade to taste with salt and black pepper. Place the chicken in a bowl or a zip-lock bag and add half of the marinade & reserve the remaining marinade in the refrigerator. Make sure the marinade is mixed with the chicken properly, and then put it in the refrigerator for at least 1 hour and up to 4 hours, turning occasionally to redistribute the marinade. Remove the chicken from the bag and pat it dry with paper towels. Season with salt and pepper, going heavy on the pepper. Heat the oil in a stainless steel pan (don’t use non-stick because the chicken might stick) over medium-high heat until it is lightly smoking. Add the chicken pieces and cook without disturbing until they are lightly browned on one side, then flip the chicken. Reduce the heat to medium and cook until the water from the chicken evaporates and the chicken is cooked through (4-5 minutes). The idea is to slightly crisp up the chicken in the same way that the street food vendors. Transfer the chicken to a cutting board and allow to cool for 5 minutes. Roughly chop the chicken into 1/2- to 1/4-inch chunks. Transfer to a medium bowl, add the remaining marinade, cover loosely with plastic, and refrigerate while you cook the rice and prepare the sauce. For the rice: Melt the butter over medium heat in a pot. Add the turmeric and cumin and cook until fragrant but not browned, about 1 minute. Add the rice and stir to coat. Cook, stirring frequently, until the rice is lightly toasted, about 4 minutes. Add the chicken broth. Season to taste with salt and pepper. Raise the heat to high and bring to a boil. Cover, reduce to a simmer, and cook for 15 minutes without disturbing. Remove from the heat and allow to rest until the water is completely absorbed and the rice is tender, about 15 minutes. Fluff it up a bit and garnish with coriander. For the sauce: In a small bowl, combine the mayonnaise, yogurt, sugar, vinegar, lemon juice, parsley, garlic, and 2 teaspoons black pepper. Whisk to combine. Season to taste with salt. To serve: Return the entire contents of the chicken bowl (chicken, marinade, and all juices) to the skillet. Cook over medium-high heat, stirring occasionally, until heated through. 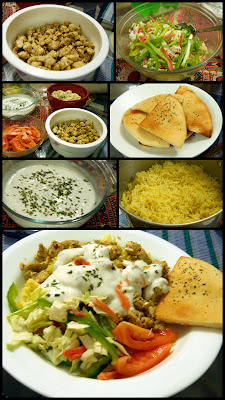 To serve, divide the rice, salad, tomato, and toasted pita bread evenly among 3-4 plates. Pile the chicken on top of the rice. Top with the white sauce and hot sauce. Serve immediately, passing extra sauce at the table. To eat, mix it all up together.